‘ SISP involves “the identification of prioritised information systems that are efficient, effective, and/or strategic in nature, together with the necessary resources (human, technical, and financial), management of change considerations, control procedures and organisational structure needed to implement these” (Baker, 1995, p. 63). The context of SISP is, in terms of scope – organisational, in perspective – that of top management, the time-frame – long (e.g., 3 – 5 years), and the level of abstraction – conceptual (Segars et al., 1998).’ (Wilkin & Cerpa, 2012:2). From the definition above, SISP is concerned with a longer-term horizon of integrating SISP with business strategy. This planning approach is strategic, conceptual, and involves the careful allocation of technical, financial, and management resources; along with proper controls and procedures (Lederer & Sethi 1996). This definition indicates that SISP must be on-going. Figure 1 summarises the iterative nature of SISP. 5) a process to review the utility of the IS systems (Bechor et a. 2010). Given the above the SISP needs to be an on-going process, tightly integrated with the business strategy planning process; and especially embedding IS/IT into the planning process to force alignment and effective IS support of the business. (Brown, 2010; Wilkin & Cerpa, 2012). These variables run across functions and departments and are complex to align and manage. As with any planning process, SISP will depend on the alignment of the firm’s functional organisation, culture and resources. Section 4: SISP – internally or externally managed? If we take the key variables in Section 3, they will inform our discussion about whether SISP should be internally or externally managed. The following table provides a summary of when or if, we should be managing a SISP internally or externally. Present? If not – Externally outsource? If we run through the key variables and dimensions impacting SISP some clarity emerges. If we have the 10 main variables operating efficiently in-house; than SISP should be internally managed. If we have none of these important variables inhouse we will be forced to use an external partner and outsource the SISP entirely. If however, like most firms, we have a mix of inhouse strengths and weaknesses, then we will probably use external partners to bolster and support our internal SISP in key areas where we are weak (Segars et al 1998). Should SISP planning be on-going or a one-time activity? Should SISP be internally managed or externally? In my view, SISP planning is an on-going iterative process, embedded within the business strategy-planning process. Since IT is in my view, the core foundation of business processes, it is only logical that firms align IT with their business strategy. Given that every firm has yearly, if not quarterly or even monthly planning cycles; it stands to reason that SISP must likewise follow a similar planning path, and be on-going, never-ending and self-reflecting process. On the question of how to manage SISP, this will depend entirely on the firm in question. If the key 10 variables are all present within a firm, and functioning well, then SISP in its entirety, should be internally managed. Even in this case, external parties should be used to verify and audit the SISP. If the firm has gaps or weaknesses in the 10 key variable areas; than part of the SISP at some level, may be externally managed for a period of time, in conjunction with the firm (including a Knowledge Transfer), until the firm acquires those skills and knowledge. At that point in time, the firm may decide to bring that part of the SISP process in-house. For many firms therefore, you would likely see some key parts of SISP managed internally, and some aspects externally managed. My preference would be to bring most if not all of the SISP in-house, since I believe that IT alignment with the business is a pre-requisite for business success and this alignment has to be present in the firm. Lederer, A.L., Sethi, V. (1996). 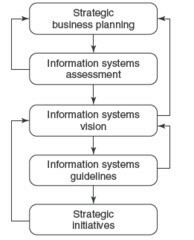 Key prescriptions for strategic information systems planning. Journal of Management Information Systems, 13(1), 35-62.